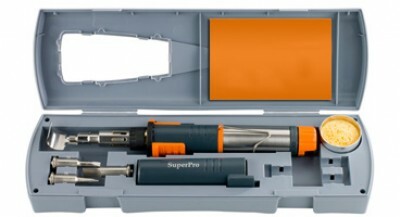 Super Pro 125 is a cordless butan-powered soldering kit, featuring an ultrasonically welded gas tank for better strength, safety and reliability. A very handy tool with adjustable temperature control and “click to ignite” function. Extra durability due to unique patented front end. Ready to melt solder less than 30 seconds from ignition?